SCHEDEL - [Terta Etas Mundi. Folium. CLXXXVI ]. SCHEDEL, H. - [Terta Etas Mundi. Folium. CLXXXVI ]. [Terta Etas Mundi. Folium. CLXXXVI ]. - SCHEDEL, H.
Title : [Terta Etas Mundi. Folium. CLXXXVI ].. Description :The Latin text page is illustrated with a depiction of two people holding a miniature of a church, a portrait of a king and the sun and the moon in the lower left corner. 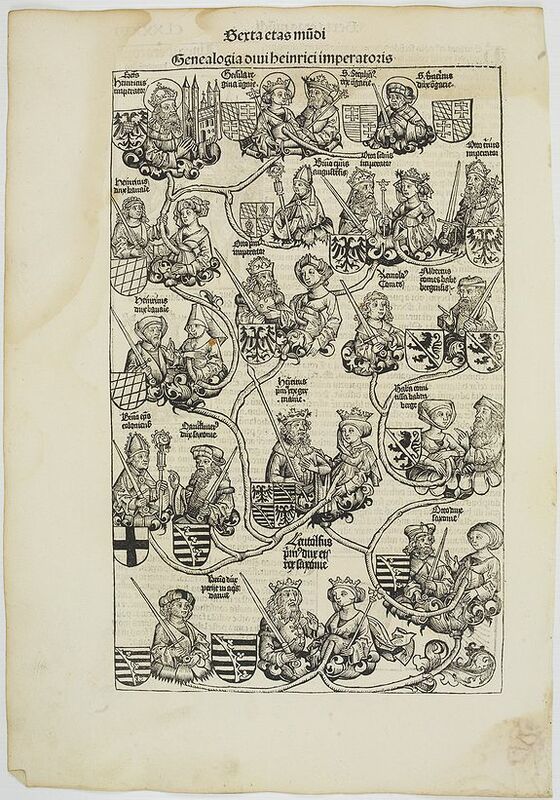 VERSO : an impressive engraving of the genealogy of Henry II. Condition : Some marginal water staining in margins and 3 cm into printed area in the upper part of page. Paper slightly age-toned. Dark impression on large sheet. Else good condition.